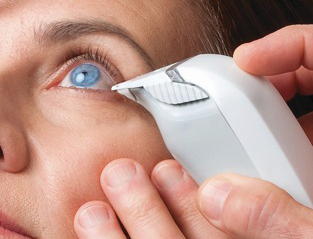 At Eye Care Specialists, we utilize Tear Lab diagnostic technology to diagnose your dry eye disease. TEARLAB is an objective and quantitative point-of-care diagnostic test that provides precise and predictive information in helping the Tear Lab Osmolarity System take a sample of the fluid from your eye and measure the osmolarity of the salt content of your tears. This test provides an objective of tear layer composition which helps your doctor determine exactly how severe your dry eye is. How does Tear Lab work? Tear Lab is an instrument that our doctors use to collect a sample of tear fluid from the eye. The test card is then calculated and will let the doctor provide a treatment plan that is right for you. Tear Lab has a positive predictive value of 89%. Positive predictive value is the probability that a person with a positive test has dry eye disease.